You will take the Dalek Factor. You will spread it through the entire history of Earth. The penultimate episode doesn’t hang about. At a crucial moment, in terms of keeping up the plot momentum of the previous episode, Whitaker switches locations and reveals us in the true epic scale of the story. He also makes exemplary use of that old Terry Nation standby; the countdown clock. 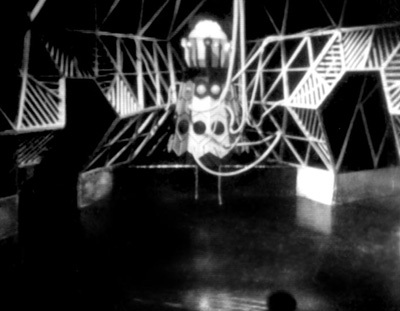 The startling and atypical climax of Episode Five feeds into the events of the first five minutes here. 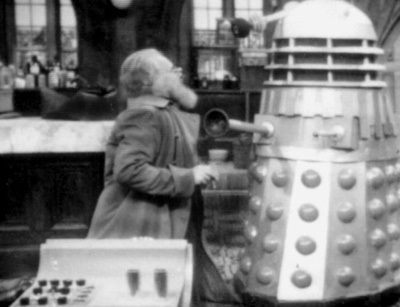 No one will use the Daleks this inventively again, and no one had before. 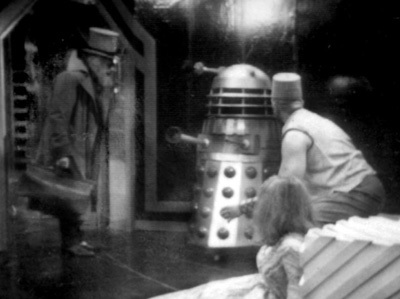 Sure, Terry Nation had a Dalek mistaking a shop dummy for a person as far back as The Dalek Invasion of Earth, but it’s always been easy to take the piss out of them. And Douglas Camfield successfully made them chilling again in The Daleks’ Master Plan. But no one else has made them endearing (certainly not Rob Shearman with his poor despondent Kaled mutant in Dalek); that Evil of the Daleks achieves this without denting their dramatic potential is as much a tribute to Martinus as it is to Whitaker (apparently the cast found the director a bit of a pain, but that’s no impediment to solid results; look at Peter Grimwade’s work on the series). The Doctor: They’re playing trains! Doubtless much of this is down to Ron “Zippy” Skelton imbuing the Human Daleks with a sing-song innocence. It’s interesting how well the slight modulation in tone works, though; how the behind-the-sofa monster becomes instantly beneficent. The Doctor: Oh, I’m dizzy. The Doctor: Maxtible, did you hear that? They’ve got a sense of humour. Maxtible: I’m glad you are so easily amused. The Doctor names them Alpha, Beta and Omega; since we never see what has happened to them, perhaps it’s a surprise they’ve never made a return. 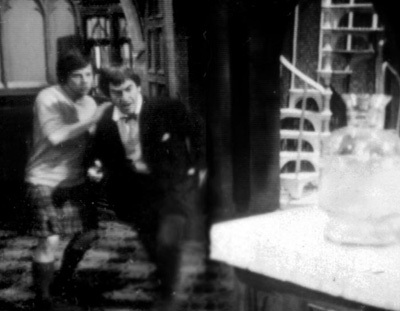 Of course, The Final Problem position of The Evil of the Daleks in Who history (Terry Nation removing his creations from the show to hawk in the US) might well have made Evila pocket best left unrummaged in (this makes, appropriately given its location, Day of the Daleks’ the series’ The Empty House). Whitaker plunders the Century 21 comic strip for the Emperor Dalek, but the most the series will ever do to reference it again is to hint at the retcon of Davros ultimately becoming it (Remembrance of the Daleks). Then there’s RTD and his Cult of Skaro; Daleks with human names and emotions. That inspiration must have come from somewhere (unfortunately he does little of merit with his idea, aside from making Dalek Caan a gibbering loon). 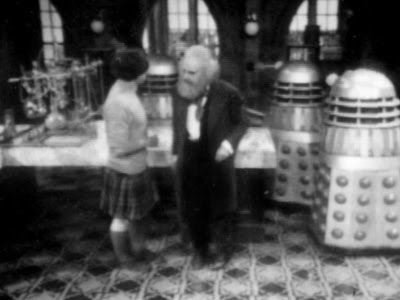 Having been ordered to return to Skaro, we see the first stirrings of dissent between Daleks. Dalek: What is that mark? Human Dalek: The Doctor gave it to me. Human Dalek: Yes. He is my friend. Because Whitaker sets another plot thread in motion, by episode’s end we are distracted from the question of why the Daleks are so careless with their Human versions. Evidently they consider that there is no danger from this element, and they seem to have enough insight into them to present the Doctor with a fake Omega once they are on Skaro (who ends up pushed over a cliff). 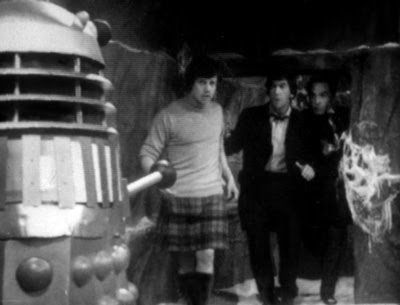 Other than for reasons of (understandably) the writer creating intrigue, it’s not clear why the Daleks don’t just apprehend the Doctor, Jamie and Waterfield at gunpoint when they arrive on Skaro. First they introduce a fake friend, and then they elicit screams from Maxtible and Victoria to attract them. The Emperor himself is a mightily impressive creation, both in design and size (the Davros “convertible” in Remembrance may overtly riff on the Century 21 strips but he is decidedly underwhelming in appearance). The Doctor: The day of the Daleks is coming to an end. The Doctor: Gradually they will come to question. They will persuade other Daleks to question. Until you have a rebellion on your planet. The Doctor: I say yes! I’ve beaten you and I don’t care what you do to me now. Emperor: Si-lence! The Human Factor showed us what the Dalek Factor was. 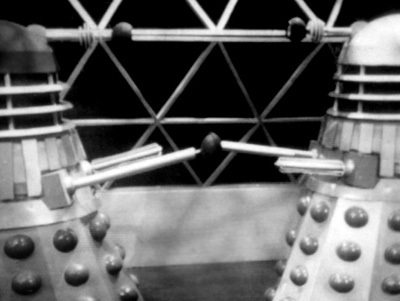 Emperor: Without knowing, you have shown the Daleks what their own strength is. It’s a clever twist at a crucial point in a lengthy story, setting manner in which the final episode will be plotted. Ultimately it will not affect the Doctor’s hopes for the Human Daleks, but it appears that the Emperor has considered everything at this point. Emperor: They (the Human Daleks) will be impregnated with the Dalek Factor. And so, the cliffhanger. 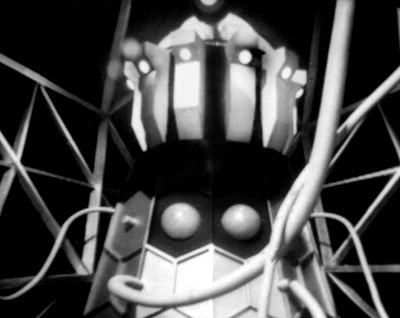 It’s much more concise than Davros’ rant at the end of Genesis of the Daleks Episode Five, but it has the same kind of chilling implication; through the Doctor’s involvement, the Daleks will become an even greater, all-consuming force. Jamie: What is the Dalek Factor? Doctor: It means to obey, to fight, to destroy, to exterminate. I won’t do it. Emperor: You will take the Dalek Factor. You will spread it through the entire history of Earth. 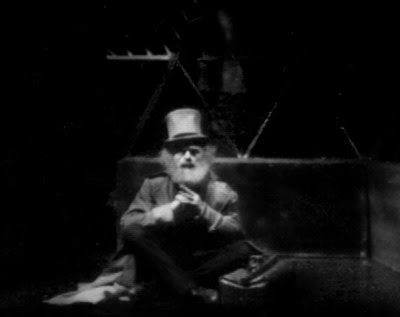 The central theme of the developments in Dalek society means that other characters are forced into the background. Maxtible is in a holding pattern of self-deception, but he’s fighting a losing battle. Waterfield finally realises his game. Waterfield: You’ve sold yourself to them, haven’t you? Maxtible: Metal into gold, that’s what the Daleks are going to give me. The Daleks bring him to Skaro because they have plans for him, but the location of his precious lab is forfeit. Dalek: We are destroying this area. Maxtible: You cannot destroy my house… You promised me. When he arrives on Skaro to find find Victoria and Kemel, his only concern is that he may not be the exclusive benefactor of his masters’ insights. Maxtible: I know why I am. Why you are here, I’ve not the faintest idea. 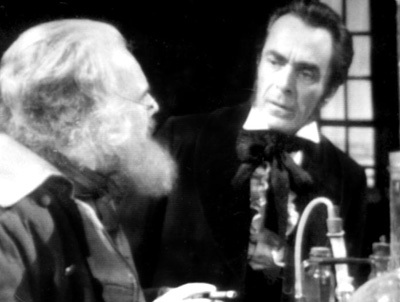 His presence in the ominous, metallic, echoing city of Skaro is an effective inversion of the Daleks amid Victoriana, and adds a suitably Wellsian aspect to the tale. There’s little to be said regarding the other characters; Victoria simpers while Kemel is as doting and emasculated as ever. 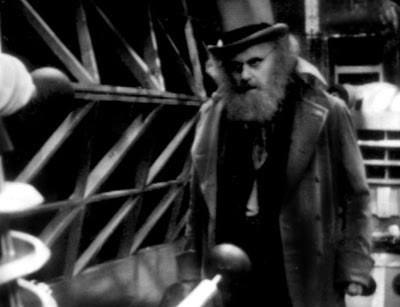 Waterfield continues to struggle with his conscience but gets less screen time. But the countdown is an effective tension builder, especially as it allows only two minutes for our heroes to escape. Which includes a bit of time spent persuading Waterfield. The Doctor: We’ll have to follow the Daleks to Skaro… We’ll find Victoria. And Kemel too. The Dalek city is evidently different in encompassment to the one we saw in The Daleks, although the Doctor seems familiar enough with it (to be honest I find all the timeline business highly confusing, so the relation between this, The Daleks and Genesis escapes me; the only definite is that Destiny’s city is the same one as seen in Genesis). 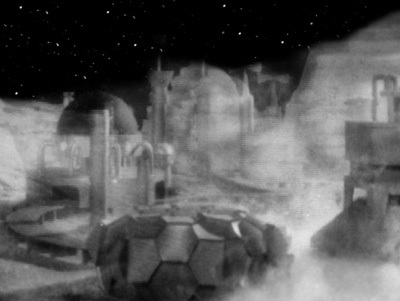 The Doctor: The city is all around us. At least, it’s beneath us. A top-notch prelude to the finale, with never-higher stakes thrust upon the Doctor (at least, in terms of the fate of humanity). The shift in location adds much to the story, particularly after five episodes in one house, while it’s clear that Whitaker has the chops to follow through with his themes (even though one should probably not look to closely at the small print).